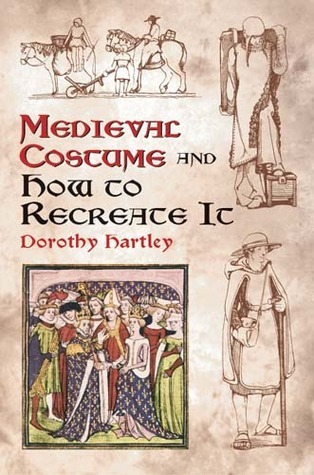 Dorothy Hartley'sMediaeval Costume and Life , now renamed by Dover, is a charming and useful book for those wishing to recreate medieval dress. Hartley writes with the fervor of a convert, or perhaps more like a pioneer? As one of the first costume historians, we can forgive her imbalances and biases. Her book is aimed squarely at theater costumers, though she mentions in her introduction that costume history can help art historians. Although she provides many original images and refers constantly to the "MSS," she never does say exactly where she gets her detailed patterns and construction techniques. Are they from original garments? Conjecture from close study of the illustrations? Her absolute self-assuredness implies the first, but it is unlikely that she had access to such rare items, if they even exist. Finally, I just want to add that her recreations, photographed on models, are absolutely charming and look excellent. I'm inspired! not bad, but...This is not my favorite book. To an expert tailor, to someone who had made a lot of clothes in various sizes and styles, the illustrations would make sense. The text is very good, identifying why one outfit is for a peasant, another for a merchant, and still another for an artisan or pilgrim. But I don't think that *i* personally could create even the simplest clothes in this book without more guidance. Damnable gusset! We're going to look stunning, but for now, I am benumbed by the vague instructions.